This landmark work presents the most illuminating portrait we have to date of goddesses and sacred female imagery in Western culture—from prehistory to contemporary goddess movements. 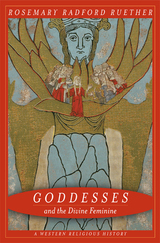 Beautifully written, lucidly conceived, and far-ranging in its implications, this work will help readers gain a better appreciation of the complexity of the social forces— mostly androcentric—that have shaped the symbolism of the sacred feminine. At the same time, it charts a new direction for finding a truly egalitarian vision of God and human relations through a feminist-ecological spirituality. Rosemary Radford Ruether begins her exploration of the divine feminine with an analysis of prehistoric archaeology that challenges the popular idea that, until their overthrow by male-dominated monotheism, many ancient societies were matriarchal in structure, governed by a feminine divinity and existing in harmony with nature. For Ruether, the historical evidence suggests the reality about these societies is much more complex. She goes on to consider key myths and rituals from Sumerian, Babylonian, Egyptian, and Anatolian cultures; to examine the relationships among gender, deity, and nature in the Hebrew religion; and to discuss the development of Mariology and female mysticism in medieval Catholicism, and the continuation of Wisdom mysticism in Protestanism. She also gives a provocative analysis of the meeting of Aztec and Christian female symbols in Mexico and of today's neo-pagan movements in the United States. Rosemary Radford Ruether is Carpenter Professor of Feminist Theology at the Graduate Theological Union in Berkeley, California. She is author of numerous books, including Sexism and Godtalk: Toward a Feminist Theology (second edition, 1993), Gaia and God: An Ecofeminist Theology of Earth Healing (1992), and Women and Redemption: A Theological History (1998).